Are wooden washbacks better than steel? The whisky industry is divided in its use of stainless steel and wooden washbacks, but as one reader asks, which is most effective? That's a question for the Whisky Professor. Stainless steel: the washback of the future? I confess I'm something of a whisky nut, and have been to 32 different distilleries all over the world, including in Sweden, France, Germany and Scotland, but there is one thing I have never quite understood around about the process. I’ve seen that some distilleries have these traditional and often very old wooden washbacks, which they claim contribute to the flavour of the whisky. However, so many others use stainless steel, and some a mixture of both. If wooden washbacks make such a difference to the product, why would distillers use anything else? Thank you for your question, and I’m glad you came to me with this, as the answer does tend to differ from distillery to distillery, I’m afraid. Washbacks – for our readers who are less familiar with the distilling process than yourself – are the tall, circular vessels used by the brewing and distilling industries to ferment wort. They vary in size and shape, but their most important feature is their size – washbacks must be large enough to hold thousands of litres of wort with extra space above the liquid for the mixture to foam up as the yeast expels carbon dioxide. 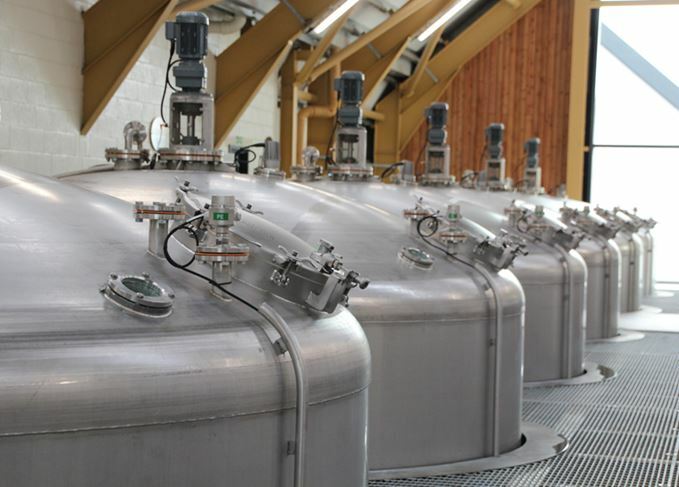 Some have switchers (rotating blades) at the top to prevent vigorous washes from bubbling over; most have carbon dioxide extractors (although only one Scottish distillery, North British, collects its carbon dioxide to sell to the carbonated drinks industry – the rest is vented to the atmosphere) and all have lids to prevent contamination from foreign objects. The most modern designs also have a sloped base to aid drainage and cleaning. Washbacks can be made from any sturdy material that is easy to clean and repair, but are traditionally made from timber, usually pine or larch for their long, straight form and tight structure that’s impervious to leaks. I recall one instance of concrete washbacks being installed by Joseph Hobbs at Ben Nevis distillery in the 1950s, but these were subsequently removed in 1981 by Whitbread. By the start of the 20th century, stainless steel had become renowned as a durable and easy-to-clean metal with a multitude of uses. After the Second World War, when it became more affordable, stainless steel washbacks were introduced to the Scotch distilling industry, but the first recorded instance of their installation is debatable. In 1949, William Delme-Evans incorporated stainless steel washbacks into Tullibardine, while George Christie installed them at Speyside distillery in 1955, although it failed to open until 1990. Indeed, almost all new distilleries built between 1960 and 1980 installed Corton or stainless steel washbacks, the only two exceptions being Clynelish (larch, 1967) and Mannochmore (larch, 1971). Both were built by Scottish Malt Distillers (DCL), which incidentally never installed stainless steel in any of its plants; nor has its successor, Diageo, replaced any of its wooden vessels. Back to your original question, Rupert: why was stainless steel so popular and why did DCL – and, even later, Diageo – refuse to install it or even ‘upgrade’ its distillery washbacks? The decision mostly comes down to cleanliness, alcohol yield and consistency. Yeast is a fussy fungus, and demands the perfect set of conditions in order to convert all the wort’s sugar into alcohol and carbon dioxide. Some of these conditions – nutrients, pH and oxygen – are already contained within the wort, but there a few which are controlled by the washback. Yeast thrives in steady, warm temperatures – 25-35°C is the optimum – but, as it grows, it emits heat. The washback therefore needs to be made of a heat-resistant material that can maintain the wash temperature evenly. As wood does not conduct heat it makes the perfect insulator, though if the wash temperature rises too high, it can be difficult to reduce. Adjusting the wash ‘setting temperature’ depending on ambient conditions in summer or winter is the most common way of ensuring the temperature of the wash doesn’t rise too high. While there is little need for adjusting temperature once fermentation is under way, the exterior of stainless steel washbacks can be sprayed with cool water. Wooden washbacks can’t. However, the most common reason for a failed fermentation is cleanliness, or lack thereof, which can lead to infection of the wort, particularly by a bacteria known as lactobacillus. Lactobacillus competes with the yeast for sugar in the wort, raising its acidity and preventing the yeast from doing its job properly, ie making alcohol. Wort can be infected by lactobacillus and other off-flavour-producing bacteria very quickly, meaning strict control over the cleanliness of the washback is imperative. Wooden washbacks are porous and full of nooks and crannies, such as between planks and in the corners of the base, where harmful bacteria can accumulate and spoil the wash. Usually a jet-powered spray of hot water and detergent, followed by around 30 minutes of steaming, can kill most micro-organisms, though some can linger. The smooth surfaces of stainless steel – particularly those with conical bases – can be more reliably cleaned, ensuring all the wee nasties are killed off. Unlike cask maturation of whisky, the timber itself does not affect the flavour of the wash – the short time it’s resident in the washback, its low abv and the age and type of the wood (up to 100 years, not oak) sees to that. Rather, the effect on flavour that you’ve heard so much about with wooden washbacks originates from claims that micro-organisms that survive cleaning regimes contribute flavour congeners to the wash. Some distillers have noted that a switch over to stainless steel has resulted in a noticeable change in the spirit’s organoleptic properties. This is the core reason why Diageo has not replaced any of its wooden washbacks with stainless steel. Others, such as Glenfarclas, which gradually swapped its wooden washbacks for stainless steel during the 1960s, believe it makes no difference at all – even so, Glenfarclas chairman George S Grant ensured the process was conducted slowly to monitor changes in the spirit. Note that, in both instances, maintaining product consistency is of utmost priority. In fact, Glenfarclas retained its wooden lids in a nod to its heritage and the traditional washbacks it had housed since the 1790s. For many distillers, the decision to retain or even install wooden washbacks in new plants in the first place is down to their romantic appeal, and nothing to do with cleanliness or consistency at all. Does yeast affect the flavour of whisky? It’s one of Scotch whisky’s three ingredients, but opinion differs on yeast’s impact. While wood is vital in flavouring whisky, it cannot take all the credit, says Angus MacRaild. Bacteria: the key to distillery character? Dave Broom seeks answers to one of Scotch whisky’s most complex and enigmatic questions.